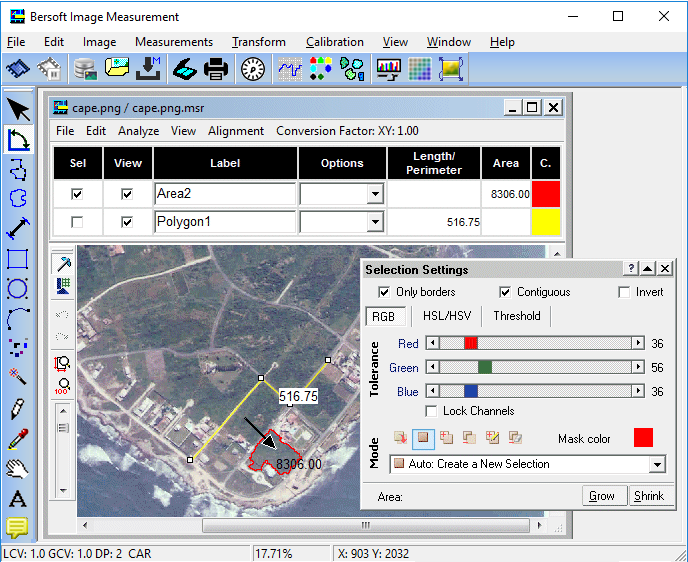 Bersoft Image Measurement 9.0 Free Download - Measures an analyzes digital images. Includes image Database. Bersoft Image Measurement (BIM) is designed as a flexible tool for acquiring, measuring and analyzing digital images. The measurements may be done by pointing and clicking or in an automated way, when doing statistical or analytical measurements. BIM can load many different types of images, including DICOM files, and also supports image acquisition from most TWAIN scanners. Angle, distance, perimeter, area, point and line measurements may be done using by using the tools in the Tools Palette. Spatial calibration is available to provide real world dimensional measurements such as kilometers, centimeters, millimeters, nanometers, microns, cm, miles, etc,. for both linear and The measurements are drawn over a measurement layer, so the original image is not altered in any way. Images can be visualized and compared in different ways, using histograms (from images or selections), generating false color images, subtracting image backgrounds, merging images, adjusting brightness, gamma and contrast, inverting image colors, manipulating channels, applying spatial convolutions with user-defined convolution masks and morphing filters. Statement: First, please download the orginal installation package by clicking the download link. Of course you may also download it from the publisher's website. Using Bersoft Image Measurement crack, key, patch, serial number, registration code, keygen is illegal. The download file hosted at publisher website. We do not provide any download link points to Rapidshare, Hotfile, Depositfiles, Mediafire, Filefactory, etc. or obtained from file sharing programs such as Limewire, Kazaa, Imesh, Ares, BearShare, BitTorrent, WinMX etc. Software piracy is theft. If you like Bersoft Image Measurement please buy it.